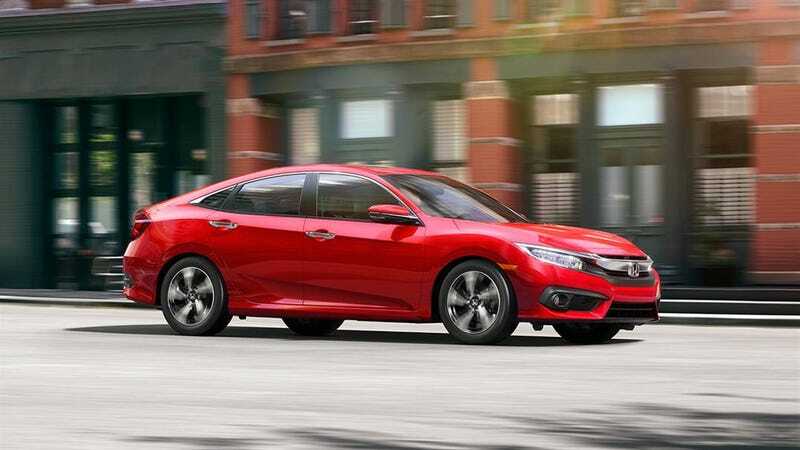 The 2016 Honda Civic was named the North American Car of the Year by a bunch of journalists who have been complaining forever that Honda offered the “better” Civic to the international market. So Honda finally gives us the good stuff like a turbocharged motor, a big flashy “H” badge, an upcoming hatchback, and the Type R.
The new Civic is certainly better than the previous generation, and if you spec one out on your own you’ll see that it is arguably the best overall value in the segment. However, some dealers are using this “all new model” excuse to give you a minimal discount. The thing is, despite the car just hitting the dealer lots, there were plenty of dealerships in the area with lots of 2016 Civics to move. I expanded my radius and found three dealerships, all within a 45-minute drive of each other, all desperate to “outbid” the other guy. After bouncing some quotes around, I got them to work the price down to $700 under invoice, which is about $2500 off the sticker price. The key to leveraging the best deal in this instance was the high density of dealerships in a given area, and a large amount of inventory. This tips the balance of supply and demand in favor of the consumer. Where people get stuck is when there are simply not that many of these new cars available. Everyone knows that limited edition sports cars will inevitably result in dealer markups, but even mainstream cars that are hard to come by can be challenging deals. In addition to my Civic client, I had another Honda customer looking for a 2016 Pilot Elite that has an MSRP of $47,470. They came to me after going to a dealership that offered them the SUV with a $3,000 markup. Can you imagine someone paying over $50,000 for a Honda crossover? The problem is that while 2016 Pilots are plentiful, Elite trim cars are very hard to find. A national search revealed about 350 Elite models in the entire country. So even in a major metro area like Los Angeles, there may only be one or two available. When that happens, the supply and demand favors of the dealers. In a case like this, a buyer shouldn’t get so hung up on what discount they think they should get, but rather compare the best deal available within that market region. One dealer ended up offering $1000 under sticker price for an incoming car. While this wasn’t the deal of the century, given the alternatives of sticker price or more it was the best way to go. Again, it all comes down to inventory. If you want a brand new model, but there are not that many to be found, you will either have to pay what the market dictates or wait until the dealer stock builds up and use it to your advantage. However, if dealers have plenty of cars to choose from on their lots, don’t settle for a small discount as other stores might be willing to sell it for less.